Installing a remote start security system in your vehicle is definitely a job for a professional. The installation of a remote start install is very complex and should only be performed by an authorized electronics dealer. When this system is properly installed you can start your vehicle via a command pad remote control and receive the ultimate security; its a remote start and security alarm pad all in one. You can warm your car up without even leaving your home, and have the piece of mind knowing that your vehicle is locked and safe from the possibility of thievery. When you decide to go with All American Window Tinting, Inc., for your remote start installation you will be sure to get a quality job that is done right and will meet all expectations of a professional install. A remote start install is a complicated job that requires precision and knowledge to ensure a proper installation that will not fail. If done wrong, issues can arise that could be detrimental to the operation of your vehicle and could potentially pose hazardous, unsafe complications. Be sure to contact our professionals at All American Window Tinting, Inc., to get the most reliable remote start installation. 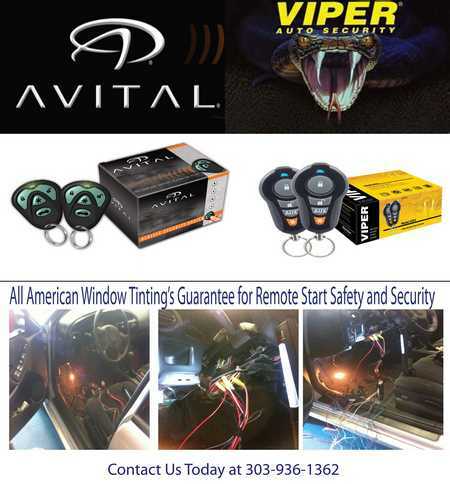 To achieve the utmost of security you can combine the benefits of a Viper Remote Start/Alarm with that of Viper Security Window Film. When these two are paired together you will be sure to have a superior barrier against smash and grab burglaries and protection against grand theft. 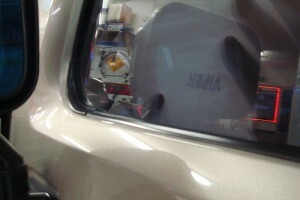 See our Security Window Film page for all the benefits this special window film has to offer. Check out the image below to see the complexity of a remote start security system installation.